Over the past couple of years, IK Multimedia has made quite a name for itself with an expansive line of mobile music apps and accessories. As is the way of things in mobile music making, the majority of those apps have so far been iOS-focused, but IK has now released a new app for Android: the iRig Recorder. This was announced in January but has only just been made available. iRig Recorder for Android is an audio recording and editing app that the company describe as "a powerful audio recording and editing app that turns a mobile Android device into a professional field recorder, and makes it easy to capture interviews, classes, rehearsals, music performances, lectures, and more, with outstanding quality. When used with the IK range of mobile microphones and accessories for Android including iRig MIC, iRig MIC Cast and iRig PRE, iRig Recorder provides a complete, ultra-portable solution, to any recording needs on the go for the popular Android platform." You can download iRig Recorder on the Google Play store. Editing and additional effects processing can be added via in-app purchase for $4.99/€4.49. Check out the press release below for full details. iRig Recorder is a simple to use audio recording app that can start recording immediately when it is launched making it the perfect "on the spot" field recorder. Users simply launch the app and hit the record button, or can also configure the app to start recording audio immediately upon launch. The app automatically groups recordings by date, tags them with geographic location information, and saves the original file as a backup. Recording time is limited only by the available memory on the device. iRig Recorder can be used with the built-in device microphone, or for superior sound quality can be used with IK's iRig MIC handheld microphone, iRig MIC Cast compact device microphone, or iRig MIC Pre professional studio XLR microphone preamp, all designed for capturing broadcast quality audio on the go. 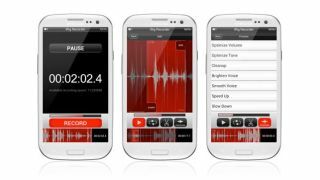 The app can also speed up or slow down a recording without changing the timbre. With its onboard processing and editing features, it's possible to produce podcasts or other types of programming, all without leaving the app. IK Multimedia is the leader in mobile music creation accessories and offers several external miking options for the Android platform that allow for the capture of higher quality recordings than can be obtained with a device's built-in mic. iRig MIC is a quality handheld mic designed for both close- and distance-recording applications. iRig MIC Cast is an ultra-compact, high-quality personal mic that attaches to the mobile device. iRig PRE is a mobile mic preamp that allows for the use of professional XLR microphones with. It even has phantom power for condenser mics. All of IK's microphone products allow for real-time monitoring of the recordings thanks to their included stereo output connector for headphones or speakers.